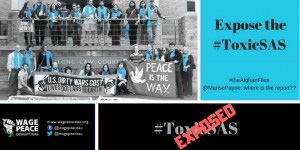 Our friends from the Victorian based #SwanIslandPeace #ToxicSAS projects, share news regarding their civil case which has been settled. We know some of you were supporting. “We wanted to update you all on our case against the Australian Defence Force. Early in the process the Commonwealth stepped in and took vicarious liability for the actions of the Australian Defence Force members who committed the assaults, so our case was against the Commonwealth. Near the beginning of the proceedings we plaintiffs Greg, Sam and Dave agreed we wanted an acknowledgement of wrong doing, and a public apology from the ADF. It is now four years since the assaults and the ADF have made it abundantly clear that there will never be an apology, public or otherwise. On Friday (15/6), a mandatory mediation occurred before the expected trial. In mediation we agreed on a settlement, meaning that this long gruelling process is finally over. It was a very difficult decision, and while we have questioned whether or not to see it as a victory, disappointment and relief seemed to be the biggest feelings of the day. We are confident that procedures have already changed as a result of our experiences. Our case has resulted in changed procedures in Australia, but not in war theatres. We will keep working for change for our sisters and brothers in affected war theatres, and encourage you to do the same. As with most mediation, the settlement requires that we do not talk about the details of the settlement itself, so we ask you to accept our decision not to share those details. There will be more to do around media in the weeks to come. We will keep you in the loop on that. ADF Atrocities: Linked to a US Culture of War; Linked to War Crimes. 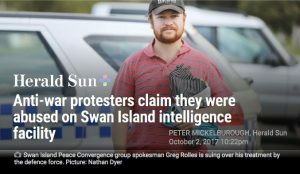 The abuse of protesters is on the lower end of atrocities committed by SAS and ADF members in Afghanistan and elsewhere overseas. A secretive inquiry is being conducted by the Inspector General of the ADF. 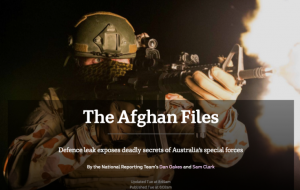 Its subject matter: the murder of innocents, cover-ups, obstruction of justice – matters raised by whistle-blowers as revealed last year in #theAfghanFiles. P.S. Read Greg Rolles’ personal reflection on what this situation means to him. “When I was younger I dreamed of being in the army…”. Thanks to Beyond War for the use of their database: you can unsubscribe at any time. Wage Peace happens on Sovereign Aboriginal Land – mostly Sovereign Yidindji Government Land – but also on the land of the Bunjalung and the Ngunnawal people. We acknowledge the Traditional Authority of the people on whose Land we live. Those of us working on the project are around the country and we invite you to play with us. or donate! for campaigns & groups disturbing war & militarism in Australia.